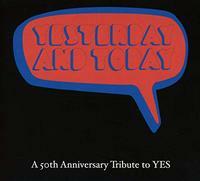 This new various artists collection, as you would imagine, pays tribute to the music of Yes. It's an intriguing set. While most of this remains quite faithful to the original material, I really love the selection of songs. They avoid the most obvious cuts like "Roundabout" and "Owner of a Lonely Heart," and manage to touch on several era of the band's history. This set allows listeners to also pay tribute by sharing in the experience of different versions of the songs we "once knew so well." The lineup includes several Yes alums (including three current members of the band) along with quite a few other notable musicians. There are several musicians who are included on most of the songs here (even when not mentioned in the "featuring" notation. Among them are Dave Kerzner, Fernando Perdomo and Billy Sherwood. The liner notes dedicate this album to Chris Squire and Peter Banks. I think they'd appreciate this set. The hard rocking sounds of this pound in with a lot of style. This is a powerhouse performance that plays it fairly faithfully. On some of the mellower moments, they out-Drama the sound, leaning it more toward Tormato era. At other points along the road this gets harder rocking even than the original. While I prefer the original version to this one, there are sections of this that I like better, and a lot of it is very close to that rendition. We get another faithful treatment here. I dig the multi-layered vocal arrangement on this piece. They preserve enough of the original rendition, while updating it just enough, to make this an exceptional rendition. In fact, I think I might actually like this more than the original. That really says a lot. I recently reviewed an album from Dave Bainbridge and Sally Minnear and was enchanted by it. You can always count on Bainbridge for quality, and this is no exception. The intricate rather folk rock based arrangement of this song is perfect for the pair, and this is another that I might actually like more than the original. It's not a huge change, but it's so powerful. Although the opening of this feels a bit different in texture, this is actually quite a faithful rendition of the tune. It's not really much of a change from the Yes version, but that's not a bad thing. This is a strong cut. It was all those years ago, and this version shows that it's still relevant today. The introduction on this is intriguing. It has a real Yes vibe, even though it's much different from the expected sound. In fact, it's about a minute and a half before the familiar textures and themes emerge, delivered with style and passion. Sonja Kristina's vocal delivery is trademark her. This is one of the least faithful renditions here, but it's also so cool. I love the rocking guitar that rises up as this number drives forward later. They preserve enough of the original while bringing a freshness and uniqueness to it to make it interesting. I dig the powerhouse jamming of this number, in all versions. This is fairly faithful to the original, but Hackett really manages to elevate it. I've always been a big fan of this tune. This comes in very faithfully and works out in style. Robert Berry's voice is particularly well suited for this song, and they put in a solid rendition of the number. It has a freshness to it, but is overall very much in line with the original version. Here's another song from the Trevor Rabin era that I've always found cool. Sure, there is a bit of a "La Bamba" feel on part of it, but that's one of its charms. Besides you have to love a song with a duck call in it. That said, while the "La Bamba" is still here, they didn't use the duck call. All that said, they play this fairly faithfully while still bringing some new textures to it. Some of the vocals on this are a dead ringer for Jon Anderson's. The cut is a powerhouse rendition that pays a nice tribute to the original. This medley is quite cool. While you might thing it features only Davison's vocals and acoustic guitar, there are some keyboards and bass in the mix on the number. Davison's does a great job and the songs fit well together. While this is different in that it's a medley, a lot of the original sound is preserved nicely on the track. I love the multiple vocal tracks on the "Wondrous Stories" part of the cut. This takes a cool, jazzy vibe in this treatment. It has some of the original flavor, particularly on the chorus, though. It's a bit updated, but still has a lot of the dreamy, hippie charm of the original version. This comes in very much like the original, but there is just a hint of an almost Brian May kind of sound on the guitar. The bass really stands out here, even more than on the original Yes version. While I prefer Jon Anderson's original vocals, Leslie Hunt's voice works well on the tune. As it should, this trails into "The Fish." Sherwood recently did another version of this cut for a Chris Squire tribute album. This version is more faithful to the original than that one was. Still, there are some intriguing differences in the sound structure here. I dig the vocals on this, and Sherwood really drives the bass with passion and fire. That's what you'd expect here, though. Coming in quite faithful to the original version, this number varies quite a bit in the vocal department. Interestingly enough, instrumentally this feels quite true to the Yes versions of the track. Mind you, some of it lands closer to some of the live versions of it than it does the studio, and the guitar soloing lends a different flavor (especially on the outro). The vocals, though, make this one of the biggest departures of the set.